With so many new members, we decided to offer a formal welcome that allowed as much time as need be for questions to catch them up on all the biz. Feedback was positive, so we'll try to keep doing that. It a lot of fun for members too, getting to know people better right off the bat. With spectacular food as usual. Urban Coup never miss the chance to hang out with our biddies in the Cohousing Australia tent chattting about cohousing to anyone who will listen. Another great year with our friends at Commonground, Moora Moora, Murandakah, and YOU who made it special. 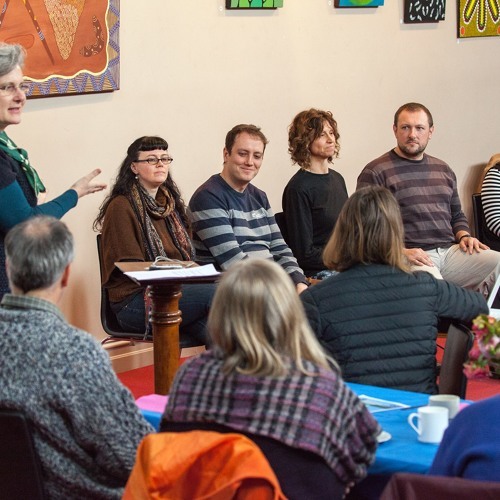 The Alternatives to Violence Project (AVP) is a network of independent not-for-profit grass-roots volunteer groups offering experiential workshops on creative conflict transformation in prisons, schools, and the wider community. Urban Coup are eternally grateful to Bev and the Melbourne crew for their sharing in this special learning space. Rhe perfect ending to 2016 with a strong partnership and possible land in our sights. We frolicked happily on The Commons rooftop garden, bubbly with gratitude for Christmas and hope for the New Year ahead.